Earlier this month the International Space Station experienced a problem with their cooling system. At the time NASA was unsure of whether a spacewalk would be necessary in order to repair the problem. Hopes were that they would be able to fix it via software. 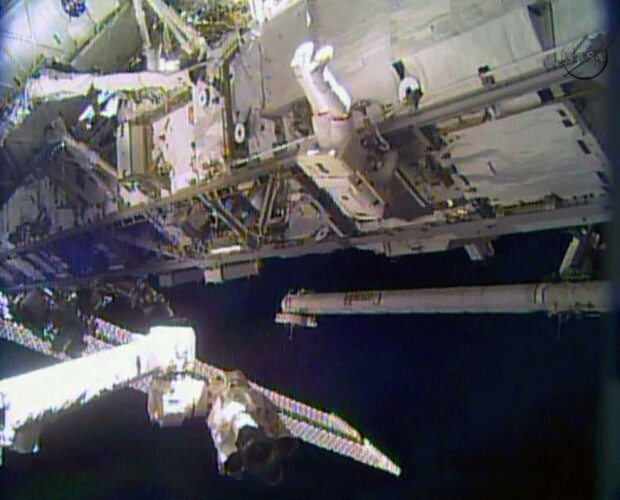 Unfortunately a software fix wasn’t in the cards and now spacewalks have begun to fix the problem. Saturday, two of the astronauts took to space in order to remove the broken ump. The operation went so smoothly there are hopes that the repairs can be made in just two spacewalks instead of the scheduled three. The first spacewalk lasted 7 ½ hours instead of the scheduled 6 ½ hours allowing them to get a jump on future walks. There was concern going into the spacewalk because of helmet flooding that had been experienced back in July. A leak in the helmet caused water to build up in the helmets causing significant drowning risks. The two astronauts, Rick Mastracchi and Michael Hopkins built snorkels out of plastic tubing and also lined their helmets with absorbent pads. Neither precaution was needed in the end. The two managed to unhook all four lines and remove the ammonia pump that contained the broken valve. They still need to install the spare pump and reconnect all the lines before the repair is complete, with installation being completed in one walk and connection of lines to be completed in a separate walk. The timeline has been pushed back to Christmas Eve for the installation but hopes are that they can install and connect all the lines easily and be able to avoid the third spacewalk all together.